A windy day caused quite a scene outside of St. George's Chapel. Welcome to the House of Wind-sor! 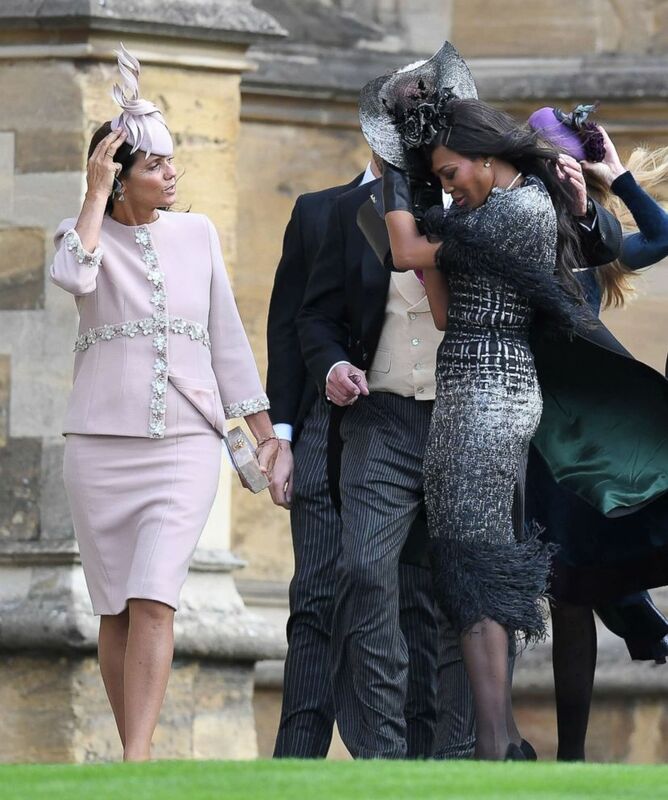 From Demi Moore to Naomi Campbell to Princess Kate to even the mother of the bride, Sarah Ferguson, it seems that no one was immune to the wind that swept through Friday’s otherwise picture-perfect royal wedding. The gusts outside St. George’s Chapel at Windsor Castle, where Princess Eugenie wed Jack Brooksbank, caused quite a scene for the couple’s more than 800 invited guests. Kate stood out in fuchsia and Meghan in navy at Princess Eugenie's wedding. The princess walked down the aisle Friday morning to marry Jack Brooksbank. Eugenie and Brooksbank's wedding is taking place at St. George's Chapel. Carefully-placed fascinators went flying, some women came close to having Marilyn Monroe moments when the wind hit their skirts and even some male guests had fashion malfunctions when the wind overtook their hats. Take a look at the tight grips guests had to keep on their way inside the chapel. (Zak Hussein/SplashNews.com) Demi Moore arrives for the Wedding Of Princess Eugenie and Jack Brooksbank, Oct. 12, 2018. (James Gourley/REX via Shutterstock) Catherine Duchess of Cambridge and Prince William attend the wedding of Princess Eugenie and Jack Brooksbank Windsor, Berkshire, U.K, Oct. 12, 2018. 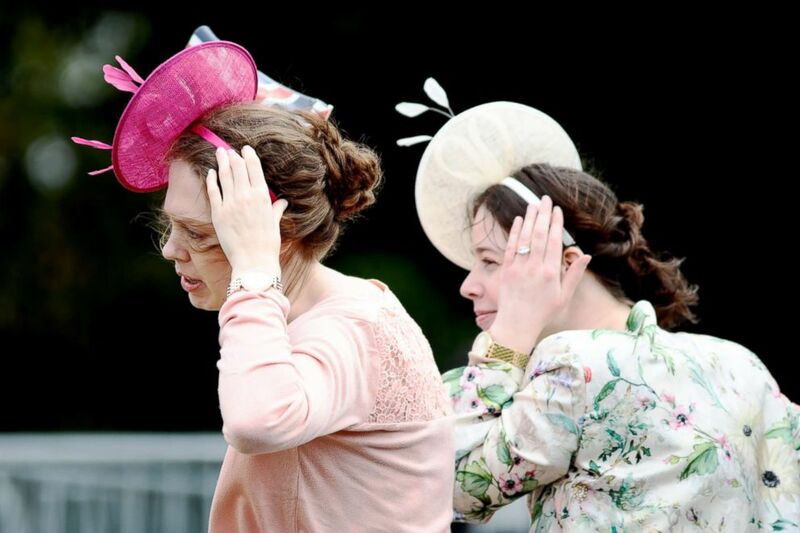 (Dan Kitwood/Getty Images) The wind blows as women try to keep their hats on their heads ahead of the Royal wedding of Princess Eugenie of York and Mr. Jack Brooksbank at St. George's Chapel, Oct. 12, 2018, in Windsor, England. 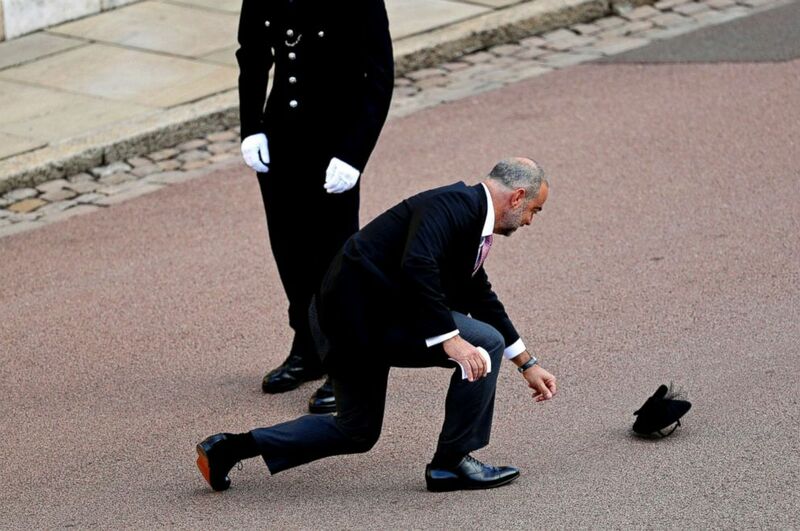 (Aaron Chown/Pool via AP) A guest loses a hat in the wind as he arrives for the wedding of Princess Eugenie of York and Jack Brooksbank at St George's Chapel, Windsor Castle, near London, Oct. 12, 2018. (SplashNews.com) Guests attend the Royal wedding of Princess Eugenie of York and Mr. Jack Brooksbank at St. George's Chapel, Oct. 12, 2018, in Windsor, England. (Victoria Jones /AFP/Getty Images) Sarah, Duchess of York and Britain's Princess Beatrice of York arrive to attend the wedding of Britain's Princess Eugenie of York to Jack Brooksbank at St George's Chapel, Windsor Castle, in Windsor, Oct. 12, 2018. (James Gourley/REX via Shutterstock) Naomi Campbell attends the Royal wedding of Princess Eugenie of York and Mr. Jack Brooksbank at St. George's Chapel, Oct. 12, 2018, in Windsor, England.